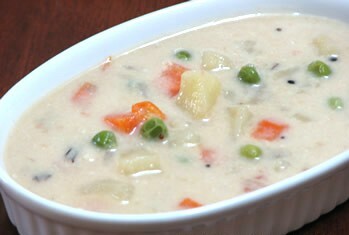 Potatoes, peas & carrots in creamy coconut milk gravy.can be eaten with vellapam or rice. Cut the potatoes and carrots into cubes. Cut the onion into thin long slices. Put the potatoes, carrots,peas,onions along with the cut green chillies and ginger into your crock pot. Add the whole black pepper,cloves and the cinnamon. Cook for 4-6 hours on high or 8-10 hours on low. Add the curry leaves towards the end. Use thick coconut milk.If using fresh coconut, then blend grated coconut with little warm water and then strain. Or you can use 'Thai'brand canned coconut milk, which has a fresh taste. Helps to maintain blood sugar places: Glucose intolerance may cause manganese deficiency in your body. Coconut milk is a rich source of manganese. Whole grains, legumes and nuts are some excellent sources of manganese. Keeps skin and blood vessels flexible and elastic: Copper is very important mineral for most of the bodily functions. Copper and vitamin C help to maintain the flexibility and elasticity of the skin and blood vessels. Aids in building strong bones: Coconut milk is not rich in calcium, but it is rich in phosphorus. Phosphorus is an essential nutrient that body needs for strengthening bones. It is must to take phosphorus with calcium particularly to prevent bone loss because it supplies phosphate to the body. Helps to prevent anemia: Lack of iron is the most common nutrient deficiency among the people throughout the world. Iron deficiency in body does not allow the body to develop enough hemoglobin for keeping sufficient oxygen levels in red blood cells, resulting in anemia. Each cup of coconut milk supplies the body with nearly a quarter of daily value of iron. Relaxes muscles and nerves: Whenever you feel muscle cramps or muscle soreness, have some food along with coconut milk. It is rich in magnesium and can help you in relieving the problem. One of the functions of magnesium is it acts as a gate block in many nerve cells. If magnesium is not present in body, nerve cells become very active because of calcium that activates nerves. Excess contraction of muscles is caused by over active nerve cells. Helps in Controlling Weight: This can be a good news for people who are trying to reduce weight. Coconut milk makes you feel full very quickly because of high concentrations of dietary fiber. Decreases the risk of joint inflammation: Selenium is an important antioxidant. It controls the free radicals and thereby helps in relieving the symptoms of arthritis. It is observed that people with low levels of selenium may suffer from rheumatoid arthritis. Helps in lowering high blood pressure: People who are concerned with their blood pressure will not face any problem for reaching the foods containing potassium. Potassium helps in lowering blood pressure levels in the body. Helps in maintaining healthy immune system: Coconut milk helps in warding off colds and coughs by keeping the immune system healthy. It supplies vitamin C to the body which boosts the immune system. Promotes the health of prostate gland: Zinc plays a vital role in promoting the health of prostate gland. A preliminary study showed that it slows down the activities of cancer cells. I hope the above mentioned information helps you in understanding the relation between health and coconut milk. It can also be consumed by people with cow’s milk allergy. It is free from gluten and soy. Hence people who are allergic to these substances can also use this. I found this recipe very interesting. Do you have others like it? I am also sending it to my friend to enjoy. Thanks for sharing and keep it up. I love the vegetable stew! I love this Vegetable stew. I have tried many times to make this but i failed. Now i got this recipe from your article it turned out great. So thank you for this. You have mentioned some great advantages of coconut milk that I have never heard before. Thanks! I like this recipe. However I found cooking for 4-6 hours on high or 8-10 hours on low is too long. Recipe is good. Join in! Tell us your story! Ask us that important question! It's easy to do. How? Simply click here Crock Pot Recipes.